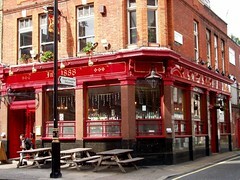 A pub just off Marylebone High Street. This place has all the makings of an excellent pub, dating as it does from the Victorian era, but something feels a little off. The Fancyapint review pins it down to its erstwhile conversion to a restaurant, and although now once again functioning as a pub, indeed the space feels large, square and slightly empty, with bare floorboards and tables dotted around. There's still some lovely old tilework on the walls, and an open fire flickering away on a December 2008 visit, but it doesn't generate too much heat. On our late-evening December visit, the place was emptying, so our group were able to spread out. There are two handpulls for ale, with Greene King IPA and Abbot Ale. Other options on draught are the usual lagers. The bar itself is tucked into a corner of the room. There are some additional benches outside the front door. Last visited by Ewan, Kat, Jo and others, 29 December 2008. Last edited 2011-06-26 14:23:45 (version 2; diff). List all versions. Page last edited 2011-06-26 14:23:45 (version 2).